Every once in awhile you’ll come across some legal minded person who thinks that recipes should be copyrighted. That he who creates a dish can somehow  ‘own’ that dish and could possibly even be paid a royalty for it every time another person makes it. I know it sounds far fetched, but there have been serious minded discussions on this topic. I think it is a fool’s goal. Virtually since the moment that a woman figured out how to put meat on a fire and cook it, the art of cooking has been a communal affair. (And you know it was a cavewoman because woman were the food preparers, so it stands to reason that she stood there saying, oh god, I don’t want to eat carpaccio again tonight and so she tried putting a little heat to the meat.) Every recipe stands on the shoulders of another recipe, on inspiration from somewhere or someone. Which brings me to the name that dish contest. I wanted to make something a little special for lunch last week because it was our anniversary. A romantic dinner is not an option during festa week, so we had to settle for a quick, but joyous lunch and we both love roast quail. I wanted to make a rich, spicy sauce as a counterpoint to the roasted quail, and I’ve been in a Renaissance spice mode recently, so there was mace, nutmeg, ginger, lots of pepper, but I used tomatoes as a base which weren’t around during the Renaissance, and I finished the sauce with a good jolt of whiskey, New Orleans style. So what could you call this creation if you wanted to honor its roots? 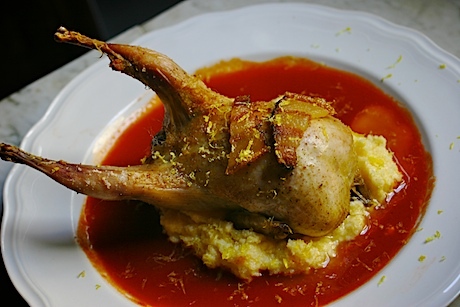 Roast Quail with a Post-Renaissance Creole Sauce accompanied by Creamy Polenta? Now, that is a catchy name that should earn me the coveted “Pretentious Dish Description” award. And now that I have a unique name, could I copyright the dish? I don’t think so because all those medieval and Renaissance cooks influenced my choice of spices, and while dreaming of merchants in Venice, I wandered into modern times with my tomatoes and then remembered how the whiskey flavor acts like jazz music to bring all the flavor components into focus. For me, paying homage to the roots of a dish is critical because no one, since the harnessing of fire, has operated without knowledge of someone else’s contribution. Cooking is one of the ultimate grand traditions and we do right by knowing and understanding its history. So the next time, you slice a tomato and throw a few leaves of basil on it, stop and think about how that dish evolved, and take comfort that you are truly not alone in the kitchen. P.S. If anyone does think of a good name for that quail dish, let me know, ok?